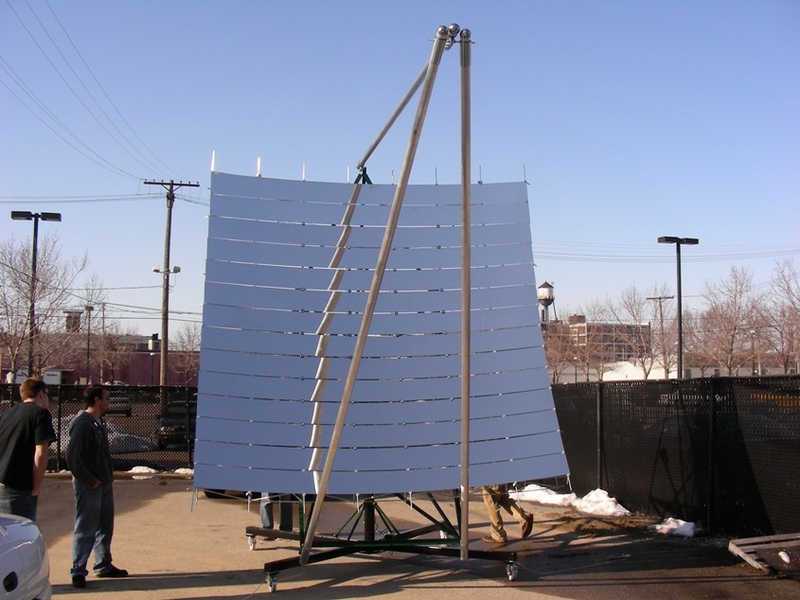 A solar concentrator is a key part of a Solar Turbine, and also a key part of a solar furnace. Please contact joseph.dolittle at gmail.com for more information. In the above design, the structure holding the collector panels is curved. Ours will lie flat on the ground; only the mirrors will be angled. This will reduce structural costs. The collector will be higher and wider: 6 inches wide to match the width of the mirrors. Just a question, is the fiberglass mandatory? Are there alternatives? Googling gives me cotton, cellulose, sheeps wool... Fire retardation can be done non-toxic according to these articles (through borates). what is the ideal spacing between slats? The current design is assuming optimum functioning at the equinox. Is this appropriate? What is the best engine to use? We are considering building a Tesla Turbine for the purpose. Will we be able to produce enough steam for the purpose? The collector is a bit short on design. How will the water be fed in? What is the best way to join sections of pipe? What is the best way to mount the collector? What details need to be considered to modularize the collector? We must go through a basic feasibility study to understand the importance and potential of solar concentrator power. First, we are considering solar concentrators for solar electric power. While there are many solar electric system options available- from photovoltaics and stirling engines to Rankine cycle low temperature electrical generators and many others - we believe that solar concentrator-powered boundary layer turbines are the lowest cost, most ecological, and simplest to manufacture route - for bringing in solar energy as a mainstreamable source of energy for advanced cultures. The future of energy is solar. NOTE: Note also that solar cells do hold good promise in the future. This would be feasible, in a decentralized economic system, if solar cells are able to be produced in small scale facilities. One such technology is ribbon PV technology, extruded using an appliance-sized machine that takes only 1 kW of power (see Evergreen Solar for an example). Moreover, this can be accomplished in a decentralized economic system only if the raw feedstock - solar grade silicon - can be produced in distributed locations - such as, even, Factor e Farm. Silicon is made from sand, and sand is ubiquitous. If abundant energy is available (such as solar concentrator power), then it is just a matter of procedure to produce all the solar grade silicon that is needed - and transcend the present "shortage" of pure silicon. The latter is merely an artifact of the economy of scarcity, where non-value-neutral technologies promoted by special interests dominate the landscape. Considering cloud cover and day/night cycles, a place like Missouri gets 6 kWhr/square meter/day of insolation throughout the year, on average. . You can check the insolation for your location in the uSA as well. Other sources indicate it is less, only 4.73. (http://solardirect.com/pv/systems/gts/gts-sizing-sun-hours.html) *detailed weather data is available for free here http://www.ncdc.noaa.gov/oa/ncdc.html free if you are coming from a .edu address otherwise about $20. * Good for simulations. Also there is a program distributed by Sandia labs called the Solar advisor Model. It is quite good and can be used in combination with other simulation methods to do earlier phases of the simulations (e.g. determine the sunlight present at the absorber for various types) as you can extract the data from various stages of the simulation from it in table form easily. The earth intercepts 10,000 more times energy from the sun than we currently use in all fossil and nonfossil fuels today. The energy intercepted per acre of land is 4 megawatts. If overall energy conversion efficiency for that land area were 5%, then you would produce 200kW of power from that acre of insolation. The boundary layer turbine is proven to be at least 25% efficient for unoptimized experiments in the literature. Note that this page is missing and I cannot find the reference on the wiki, but that may well be the mechanical efficiency of the turbine, not of a steam engine utilizing it. That is very low. A normal bladed turbine is more than 60% efficient mechanically. More importantly and fundamentally the centrifugal force on a steam turbine of small size is the main limiting factor here. There is a more detailed analysis of this in the forum http://forum.opensourceecology.org/discussion/149/steam-engine . Counting overall system efficiency, 10% efficiency is easily attained. In fact it is even higher for dish stirling engines. Infinia gets 28% with the thermal-electric conversion at full sun, and the dish collectors are more than 90% efficient, the absorber is about 80%, so that leaves 20%. Low cost rankine engines using automobile supercharger turbines used for hospital electric power can get 8% or so at full sun. Note it goes down substantially at lower insolation, unlike solar panels, and this must be factored in to estimate overall system performance accurately. If only half the land area is solar collectors (rest is access, etc. ), then 5% is a reasonable figure. There's no reason we can't do substantially more than half. The 200 kW obtainable per acre is comparable, on a per-acre basis, to coal power plants. Coal power plant of 1 square mile - 640 acres/mile * 200kW/acre ~ 100 MW output per square mile if the area was in solar concentrators. So, 10 square miles would constitue a gigawatt solar power plant. This is comparable to the area and output of coal plants. This might not be because the advanced Stirlings are not efficient, but because there is so few of them per acre. This would be no different for a steam system though. A concentrator is a concentrator. An estimated 10 panels are needed to run a tesla turbine or equivalent. Total cost of panels would be $1800. Turbine and generator are estimated to cost $600. Assuming a low 5% efficiency, 300 ft2 of collectors will produce 1.5 kW of electric power. But, turbine scales at $20 per additional kilowatt of power output, and $40 for additional electric power output. Cost of 500 square feet is $2500. Nominal 100 kW system costs $50,000 for solar concentrators, and $2500 for generator heads, and about $2500 for the turbines. Bottom line: For anyone who understands these numbers, this "we can be sure it will change life as we know it", quoted regarding energy from another article discussing P2P energy solutions. This is cheaper than any known power generation strategy. Note that laser cutting may be required for turbine fabrication, but this tool should also be opensourced and made available at a predicted cost of $5k for a laser cutter for 1/16 inch stainless steel plate. One must study the above data carefully to become convinced of the possibility. The greatest question that may arise is not whether the efficiency of the turbine is correct. The figure of 10% that we are using has been proven, and it is conservative. The real question is, can the cost deliverables be met. the $5/sq ft balance of system cost should be achievable. If it is not achievable by utilizing off-shelf steel or lumber components, then we will utilize compressed earth blocks and self-milled lumber to reach the cost requirement. The weak link in the system is the boundary layer turbine itself. So far, we have heard conflicting messages on its feasibility. Scientific journals have showed 25% efficiency for a small, steam-powered boundary layer turbine. If that is true - then this is enough information to go on to take on the development of the turbine. Indeed, I found that Dan Granett ran a 16-disk, 12-inch diameter turbine successfully on compressed air to generate 4 kW of electric power. His design did not have seals, so he designed a simplified turbine, with seals - Boundary Layer Turbine - which is the design that we're working on. We are interested in tracking down those researchers. One of them is Warren Rice, author of the above 25% turbine paper. He was professor of Engineering Science at Arizona State University, Tempe, AZ, when he wrote the paper in 1963. We would appreciate any help in tracking down the true story of why the boundary layer turbine has not attained wider acceptance. Note: it needs to be verified if this 25% figure refers to mechanical efficiency or not. If so that is the explanation; bladed turbines have more than 60% efficiency at optimal speed. If there is a small-scale turbine that is so efficient, why has this not been commercialized? Our research indicates that this is because much more efficient bladed turbines have been produced. However, those turbines are at least a factor of 10 times more expensive. Thus, for particular applications, the boundary layer turbine may be a suitable, cost-effective option. This is also the conclusion drawn on p. 35 of Rice, Warren, Transactions of the ASME, Journal of Engineering and Power, January 1965. If the turbine does not work as expected, we will move on to other options. One retrogressive option could be as primitive as proven steam engines, which are 5% efficient for unoptimized models. We are talking of ridiculously low performance, but if the final system cost is correspondingly low, then we just might have a technology that could change the world. Indeed, 5% efficiency is a factor 3 lower than solar cells - and given the significantly lower cost per installed watt than photovoltaics, that may be a much better solution than photovoltaics. 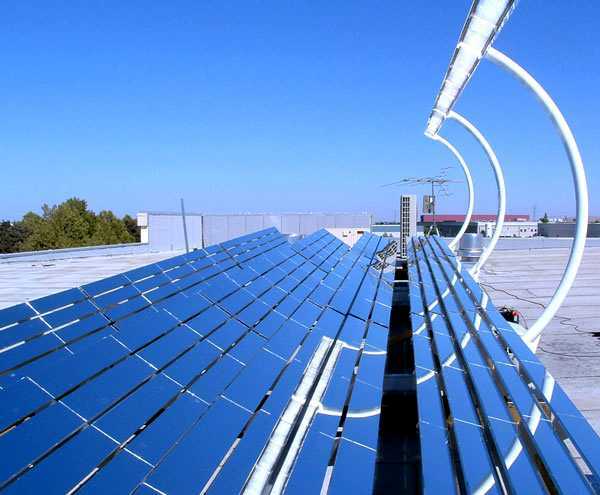 Stirling Energy Systems utility solar - 20-year purchase agreement between Southern California Edison and Stirling Energy Systems, Inc. will result in 20,000+ dish array covering 4,500 acres capable of generating 500 MW, at a cost competitive to grid power. 37 foot diameter dishes. Each dish yields 25 kW. Nice. pi*18^2= 1074 sq feet, or exactly 100 square meters. 25% overall efficiency for the most advanced Stirling engine. Note: The above example yields 100 kW/acre. Our calculations indicate the following for our system. 4 MW/acre is the basic insolation rate. If it is converted to electricity with an overall efficiency of 5%, this results in 200 kW/acre. If we have a 50% fill factor, we have 100 kW/acre. Our simple system is predicted to be competitive with advanced Stirling engines on a per-acre power basis. Our cost will be approximately 10 times lower. Flat concentrators are the simplest to manufacture. They can also be scaled infinitely. Parabolic ones are scaleable, too, but expensive. Dish systems are even more expensive, and not scaleable. Photovoltaic systems have been out of reach for society since they were invented. In our opinion, they will not become affordable to consumers until a true renegade innovator, not mainstream companies, make them available. Today, with no technological breakthroughs, solar concentrators may be implemented. If developed in the open source context, we predict 80 cents/installed watt as above. Welcome energy abundance, bye-bye to many of the present geopolitical quabbles. 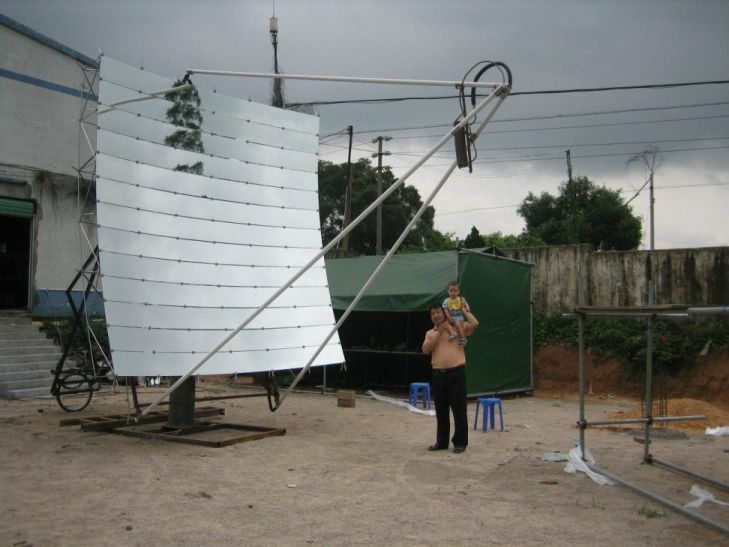 Compound Parabolic Trough Solar Concentrator. This design uses non-imaging optics and therefore does not require daily tracking, only some seasonal tracking. More details at Fossil Freedom . A variation on this concept would be a bi-paraboloid Fresnel-like arrangement of flat mirrors, similar to the example above. Multi-junction concentrator photovoltaic cells, which are approaching 40% conversion efficiency, and operate best at 400-1000 suns illumination. They use a large amount of cheap mirror area and a small amount of PV cell, so even though the cells themselves are difficult to produce independently, they are only a small component of the overall system. Calcination of minerals to produce cement, which also requires high temperatures. Parabolic shapes can be generated by the method of spincasting. Rotating fluids assume a parabola under gravity as explained at Liquid Mirror Equilibrium. Thus by spinning a casting bed or mold and adding a molten or castable material (paper fibers with setting agent, reinforced concrete, etc) it will automatically produce a paraboloid. Segments for an expandable or large dish can be made by offsetting the mold from the center of rotation on a pivot arm, with a counterweight for balance. Once created, the surface is then polished if needed, and covered with a reflective material such as small mirrors, aluminum foil, etc. This would be suitable for occasional or batch uses. For more regular use a more robust design would be preferred. Strips of a flexible, smooth surfaced support material are formed into parabolas with support ribs as needed. For example 5 mm Lauan plywood with exterior paint fastened to curved ribs. The strips should be approx as wide as your rolls of aluminum foil, and a convenient length such as 8 ft for plywood. Use contact cement to glue foil to strips. Mount strips in parallel on a support frame, and tilted to a common focus. Support frame in turn is hung from polar aligned pipe, so single axis motion will follow the sun. Target for sunlight is supported by a frame with a sliding adjustment parallel to polar aligned pipe. This allows for seasonal adjustment of sun elevation. The frame should be metal with foil wrap to deflect intense sunlight. Target mount should allow for using various targets for different uses. Alternately the upper end of the polar aligned pipe can be raised or lowered for seasonal changes, but this may be too heavy to adjust for a large system. Another alternate is to angle one end of each strip vertically for seasons. Counterweights are added below the dish to balance the heated target. The entire system is tarped over to protect it from rain, and accidental burns when not in use. Covering some strips or parts thereof can adjust power level as needed. The focal line would be approx one strip wide by whatever surface accuracy the foil has in the length direction. Uses are any that need batch high heat. Extra low tech: rests frame on ground propped up by support legs to sun angle, and moved manually. This will only be practical for small versions. This page was last edited on 2 July 2013, at 22:06.